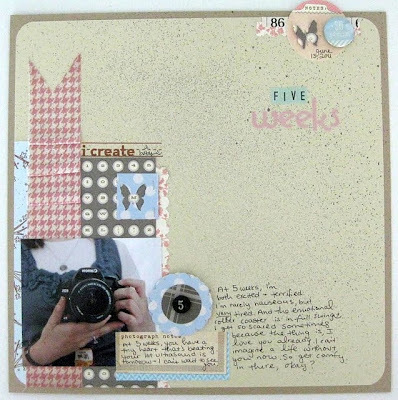 Over the Rainbow: Elle's Studio August Layouts! Most of my layouts were created over the past few months and saved up for when I could share about the babes (who we call "bunny" for now). For my first layout, I loved using my favorite sheet of Sassafrass paper for the background, and I added a lot of bits and pieces that I love! I added some of my favorite Elle's Studio products, like the Handmade Layers pennants and the month tag from the Savoring Summer kit. This next layout is the title of the pregnancy album. It's also the explanation for Why I Need To Have A Girl, since this was my attempt at being gender neutral. Oy. Can you see my attempt at masculinity with the blue star and little boy rub-on? Ha! This was my first baby layout, about how I was feeling at 5 weeks, very shortly after I found out. I might have gotten a little over-excited with the misting, but I love the soft colors and the memories it contains. So there you have it--my August Elle's layouts! Be sure to check out the rest of the gallery right here. Also, Elle's is having a moving sale going on right now! Information can be found right here. While you go shopping, I'm going to run around and take care of errands so that I can party it up for my birthday tomorrow! Yay! What amazing pages, and congratulations!!! You are rocking the Elle's Studio. Off to check out the rest of the gallery! Sweet, sweet Lo's!!! Take care of you two!!! Love the "gender neurtral" pages. LOL And congrats again, what an exciting time! I'm not even looking at the sale. If I had less then a milk crate full of paper I would, but God knows I need to use some that I have before I buy more! Your layouts are amazing, Keshet! You can just feel the joy and happiness in them :) I think that is wonderful!!! I absolutely love all of Elle's journaling cards. Especially the layers ones! I bought the Savouring Summer mini album kit and just love it! Congratulations with your pregnancy!!! Love your layouts. Love seeing all of your baby layouts! Congrats again! I love all your layouts, but that baby one is amazing... Thanks for sharing. Congrats! They are all wonderful! your layouts are fab girl - love the Waiting layout! Just love how you're documenting the pregnancy! These are fantastic! precious. so happy for you. these layouts are so full of love and hope! I am still hoarding that camera sticker lol. Very pretty, Keshet! Love that Sass. I love the "5 weeks" layout. Congrats again. It is so wonderful! And I haven't bought any Elle's Studio, but I have long admired them. Love the layouts! Super fun and whimsical! Awww... Baby layouts! Boys can have pink on their LOs too :) Love both of these, btw. I can see you love of all things girly, teehee.